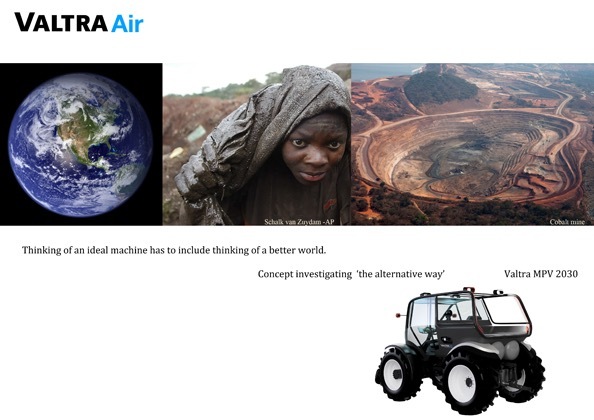 Thinking of an ideal machine has to include thinking of a better world. 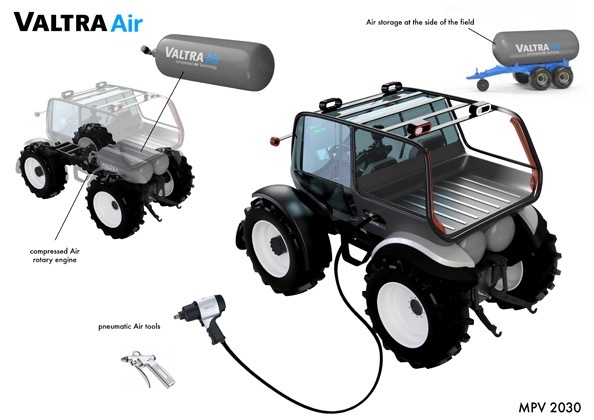 Compressed air engine is a considered lightweight alternative for full electric. We all want the best for our children and our planet. Unfortunately we have to deal with wars, growing worldwide inequality, pollution and earth destruction. Because of that we are facing serious problems like climate change and human migration. This concept is investigating ‘the alternative way’. Electrifying vehicles will transfer the pollution to other area’s. Mining for cobalt, as used in Lithium-ion batteries, is causing enormous destruction of the earth and give the workers (among them children) a life we don’t want to wish for our own families. Beside this it will enlarge the inequality and the migration problem. We all live on the same planet. We have to search for a global solution. 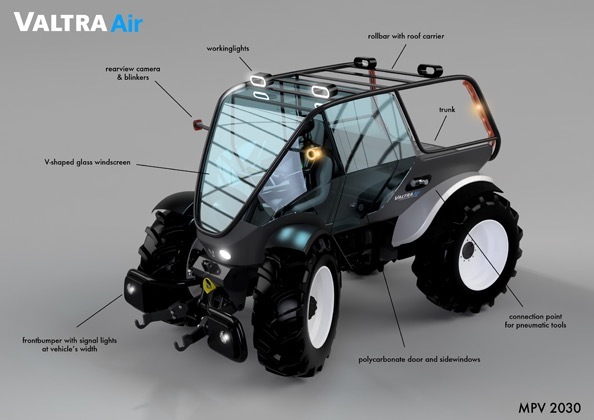 Could we think of alternative ways instead of the electrification of agricultural vehicles? Could we help the farmers to be more independent? Could we think of a solution, which is sustainable for the people and the planet for 2030. 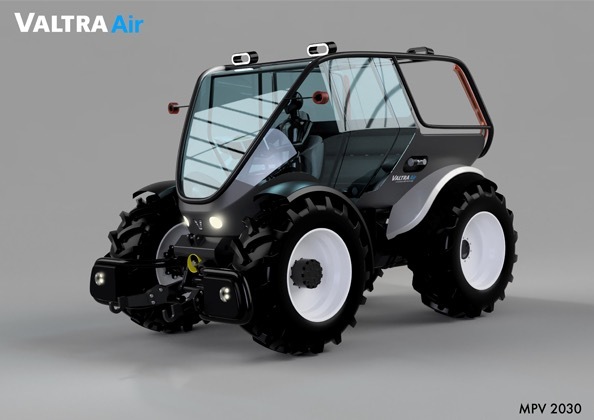 Valtra Air will not replace the most efficient and economical specialised machines. But it can do the work, which can’t be done automatically and it should do it better. 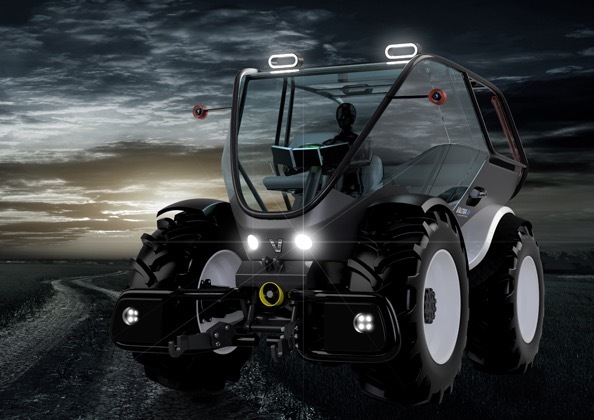 It can use all known agricultural machines known on the farm like ploughs, cultivators and seeders. It has a trunk and roof carrier to carry all the things you need, for instance when repairing the fence or local shopping. Possibility to connect pneumatic tools. The engine is a further development of the sustainable bio methane (compressed liquid gas) engine. 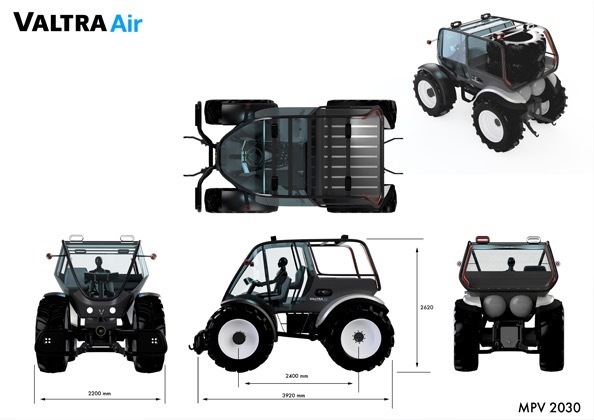 Final target is a 100% compressed air rotary engine in 2030. We’ll have clean air without the threats of producing batteries. Wheel size and low forward cabin are less intimidating and achieve better interaction with other road users. Integrated front bumper with signal lights indicates vehicle’s width at night.